We have had some great responses to WHEN PRINCIPLE WAS KING. This is a 408 page hard back with a beautiful dust jacket. 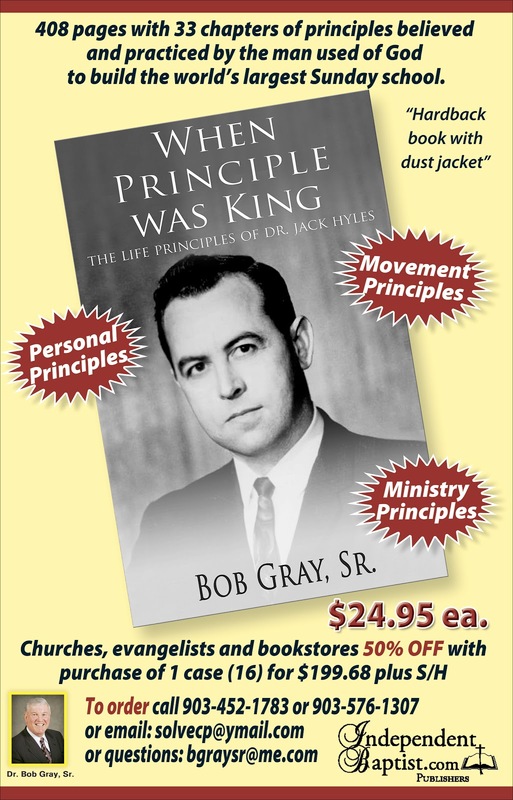 There are 33 chapters of the life principles of Dr. Jack Hyles. There are three sections in this book. You will love this book and I believe you will relive many things about Dr. Hyles that will warm your heart. He use to talk about punching “the reset button.” The pages of this book will help you refocus and take inventory over the Biblical principles that ruled his life and ministry. There are just 3 days left on the 50% off of a case of 16 books. They will sell for $24.95 per book after the first of the year, but this offer is for $12.50 a book plus S/H. Your young people need this book especially young preachers. You can call 903-576-1307 or 903-237-9019. You may also email bgraysr@me.com if you have any questions. GOTTA LOVE THE OLD TIME RELIGION!